Apple's U.S. Patent No. 8,378,797 for a "Method and apparatus for localization of haptic feedback" describes a system where at least two actuators are positioned beneath a multitouch input device to provide vibratory feedback when a user makes contact with the unit. More specifically, the patent provides for one actuator to induce a feedback vibration, while at least one other actuator creates a second vibration to suppress the first from propagating to unwanted regions of the device, thereby "localizing" the haptic experience. While the patent gives the example of a "virtual keyboard," the language specifically notes the invention can be applied to any multitouch interface, such as the keyboard of a touch-sensitive mobile communications device like an iPhone. Although Apple's handset does not currently boast a haptic feedback system, the technology is used in other smartphones as a way to enhance a user's experience with the device. As noted in the patent's language, there are solutions that feature a number of separate actuators situated at various locations under a single surface where users typically interact with the UI. For example, static "home" or "software" capacitive buttons can have actuators positioned beneath them as a user is likely to make contact with that location many times while handling a device. 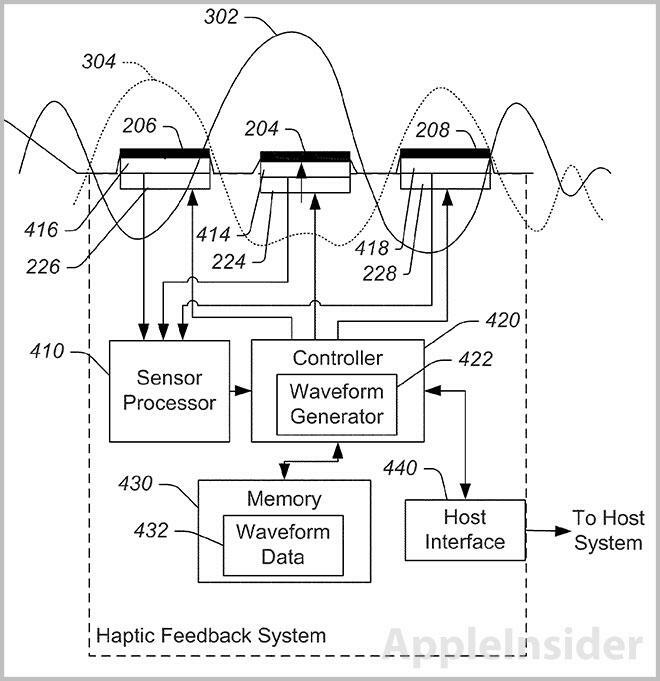 Unlike other technologies, however, Apple's patent covers a plurality of actuators situated across a broad field, enabling precise haptic feedback for multitouch panels. A problem arises when attempting to use tactile feedback with a multitouch display, which is the management of propagating vibrations to unwanted sectors of the screen. To focus the system's vibrations at a single point of contact, the patent uses destructive interference created at various points away from the originating, and wanted, vibration to obscure or otherwise cancel the propagating "vibratory crosstalk." 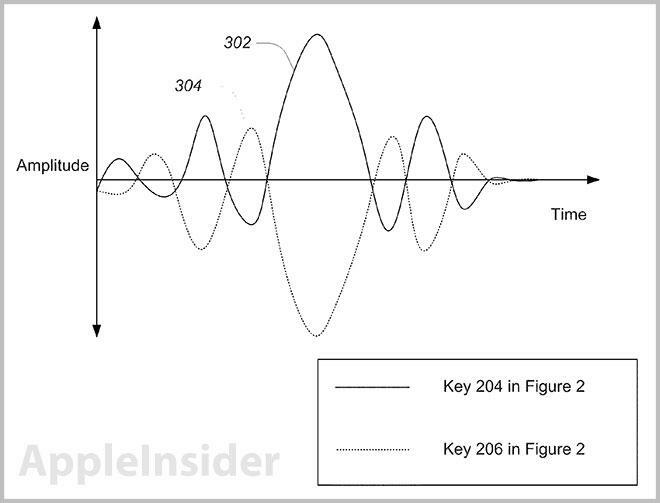 Waveform amplitude and complimentary suppression waveform amplitude. As an example, Apple applies the method to a virtual keyboard. When the operating system logs a touch event, perhaps at the "A" key, the corresponding actuator positioned beneath the contact point is activated, causing a small vibration. In order to stop this vibration from moving across the device to a finger located near the "L" key, a number of actuators provide a suppression waveform that "masks or otherwise changes the ultimate vibration at these other contact locations." The actuators' vibrations can be pre-configured depending on whether they are positioned between a touch location and suppression area, or adjacent to each other. By controlling the frequency and amplitude of the emitted vibrations, the system can effectively stop propagating waves or "crosstalk." It is unclear if Apple plans to use the invention in an upcoming handset or tablet, though the company has a number of haptic feedback patents and patent applications in its portfolio. Apple's '797 patent was first filed for in 2009 and credits Aleksandar Pance, Paul Alioshin, Brett Bilbrey and David T. Amm as its inventors.